America Revealed: Is America Already a Police State? After writing two recent articles covering the emerging global revolt, neither of which examined the coinciding emergence and growth of the global police state, particularly in America, I felt it was necessary to briefly evaluate the elite’s repressive response to the coming insurrection of their long-coveted slaves. 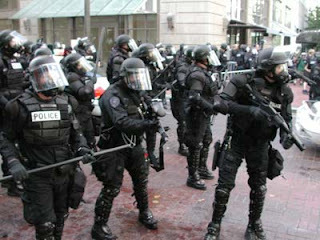 This article will focus on the developing police state in the United States. An analysis of international police state developments is beyond the scope of this article and a subject deserving another article of its own, if not an entire series. In the last eight years we have seen a slew of police state legislation, to the point that it has often been hard to keep up. By now, most take the Department of Homeland Security for granted, but the implications of its emergence should not be ignored. We’ve all, of course, heard of the PATRIOT Act*, though by now it is in the back of our minds, having been normalized in the discourse of the mainstream, corporate media. A few remember the ‘continuity of government’ measures implemented during 9/11 (though few are aware that they were never revoked and instead left in place indefinitely). Many haven’t forgotten the Domestic Security Enhancement Act of 2003. Still, many Americans have lost track of the legislative developments, or assumed that the end of the Bush era meant the end of the era of police state preparations, which it obviously did not.